It’s the first time in the awards’ 27-year history that a Man of the Year has been named. FOR THE FIRST time ever, a man is receiving one of Glamour’s Women of the Year awards. And it’s none other than Bono. 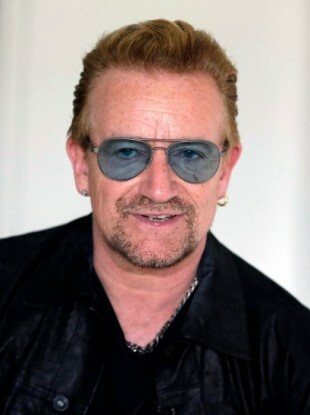 The U2 frontman was chosen for his work with the ONE Campaign, an advocacy organisation aiming to end extreme poverty and preventable disease, particularly in Africa. Here’s how the magazine explained their decision: “For years our Women of the Year advisory board — made up of past winners, plus our editors — has put the kibosh on naming a Man of the Year on the grounds that men aren’t exactly hurting for awards in this world and that here at Glamour the tribe we’re into celebrating is female. “But these days most women want men — no, need men — in our tribe. When the [US] president declared himself a feminist, when super-cool actors line up to endorse the United Nations’ #HeForShe campaign, when a major male rock star who could do anything at all with his life decides to focus on the rights of women and girls worldwide — well, all that’s worth celebrating. The awards are in their 27th year and will be presented at a ceremony in Los Angeles on 14 November. Other winners this year include singer Gwen Stefani; Olympian Simone Biles; the three women who founded the Black Lives Matter movement: Patrisse Cullors, Alicia Garza, and Opal Tometi; the Stanford sexual assault case survivor, now known as Emily Doe; and IMF chief Christine Lagarde. Read: Damp squib – or smoking gun: What are the facts behind Hillary’s email problems? Email “Bono named on Glamour's Women of the Year list ”. Feedback on “Bono named on Glamour's Women of the Year list ”.